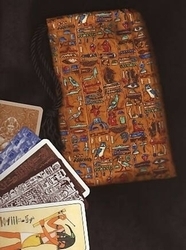 Evoke the magic and mystique of Ancient Egypt with this Cartouche Tarot Bag. Decorated with fans, lotus blossoms, cats, feathers, paw prints, birds, and other symbols found in tombs and temples of ancient Egypt, this is the perfect choice for Egyptian themed tarot or oracle decks. 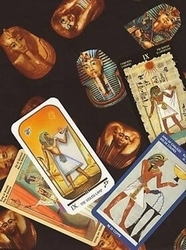 It is pictured with two cards from Silvana Alasia's Egyptian Tarot. 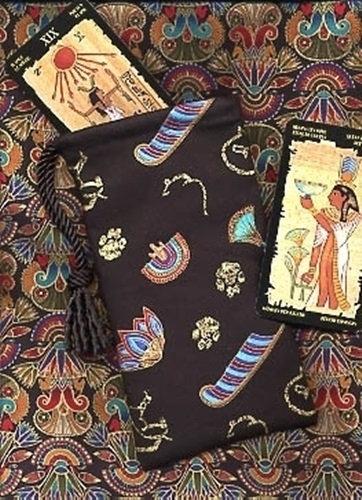 Feathers in ancient Egypt usually represented Ma'at, the Goddess of Truth and Order. She was always depicted with an ostrich feather in her hair and similar to the ostrich feather on this bag. Lotus Flowers close each night and sink below the water's surface, only to rise again in the morning. 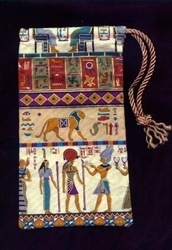 As such, the sacred blue lotus (seshen in ancient Egyptian) depicted on this bag is a symbol of rebirth. It was closely associated with the Osirian cult and funerary ceremonies. 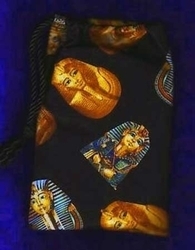 Cats were highly esteemed in ancient Egypt and were seen as semi-divine. Because Egyptians relied on grains more than any other food crop, cats were crucial to keep mice and other rodents at bay. While many deities were associated with the feline, the best known are Bastet and Sekhmet.